London architecture studio Denizen Works has revealed plans to build a canalboat that doubles as a church, featuring a roof that expands and contracts like the bellows of an organ. The Floating Church is designed to journey through London's canal network to reach Christian worshippers. 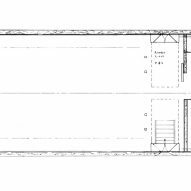 Based on the pop-up sleeping pods found on old VW camper vans, the boat will feature an extendable aluminium roof, allowing it to grow in size for services. A series of pneumatic arms will enable this motion, through the use of worm-screws and air rams. Denizen Works based this feature on the bellows of a church organ, although it is also reminiscent of a giant accordion. The Hackney-based architecture studio developed the design in collaboration with boatbuilder Turks, sailmaker Jeckells and yacht specialists Tucker Designs, after winning a competition for the project at the start of 2017. The project was organised by the Diocese of London – a collection of parishes, chaplaincies and other Christian faith organisations in north London, all overseen by the Church of England. "As architects, it's been fascinating to engage with a different strand of the construction industry," said Andrew Ingham, architect at Denizen Works. "Working closely with our collaborators and the Diocese of London, we have designed a boat which we think will become a landmark on the London canal, and provide its users with a unique and inspiring space." 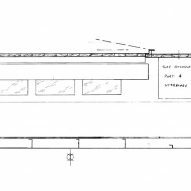 If all necessary funding is secured, construction of the Floating Church will begin in March 2018, with a target to complete by the end of the year. The aim is for the boat to regularly moor at major regeneration sites all over north London, to help foster new congregations in areas that are undergoing change. Although it will primarily operate as a church, it will also host community events such as supper clubs, book groups and art classes. The boat's exterior will be painted in traditional maritime hues, while the roof will feature a custom stitching design that highlights its folds. The interior will be kept simple, with whitewashed plywood walls and a timber-covered ceiling. Perforated metal screens will be added to the windows, which can be drawn up or down to suit different privacy requirements. Denizen Works is led by architect Murray Kerr. The studio's portfolio includes a number of residential projects, including a seaside apartment building in Whitstable and a revamped cottage in Scotland's Outer Hebrides. The team has never designed a boat before – although some of their fellow London studios have. 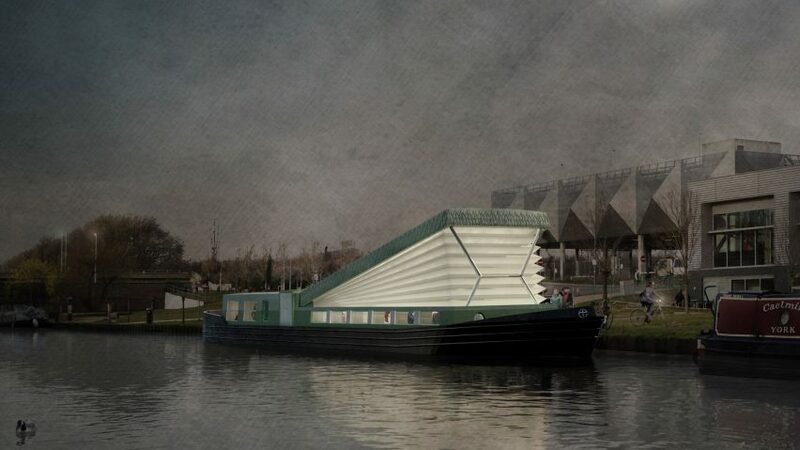 Both Studio Weave and Duggan Morris Architects have previously created floating cinemas for London's waterways.